Note: The route designation UZ is for convenience only, and was not used by the operator. Urban trams (first system) : (horse-drawn) 3 July 1889 - ? ; (electric) 20 June 1906 - 15 Jan. 1939. Urban trams (second system): (electric) 17 Dec. 1983 - today. Interurban trams (Utrecht - Zeist): (horse-drawn) 29 Apr. 1879 - 20 Aug. 1909; (electric) 20 Aug. 1909 - 3 May 1949. Interurban trams (Utrecht - Vreeswijk): (steam, then horse-drawn) 12 Dec. 1883 - 2 Jan. 1929. Donders, M. "Utrecht Uithoflijn: Development and challenges", Tramways & Urban Transit, Aug. 2015 (78: 932), p.319-321. 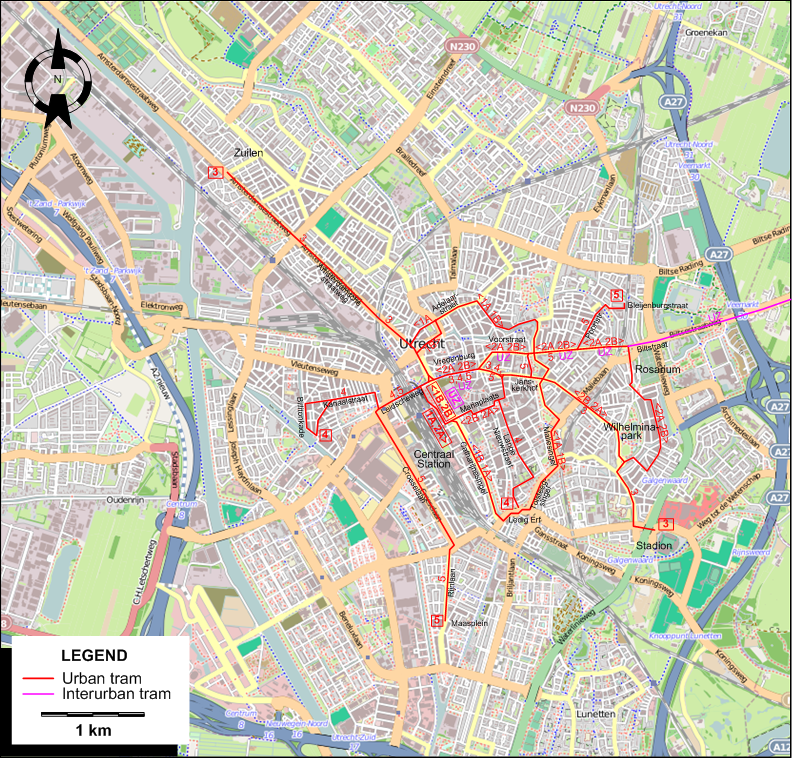 Pulling, N. "Systems Factfile No.106: Utrecht, Netherlands", Tramways & Urban Transit, Aug. 2016 (79: 944), p.304-308. Wansbeek, C.J. "New lease of life for Utrecht Sneltram", Tramways & Urban Transit, June 2000 (63: 750), p.212-214. Wansbeek, C.J. "Utrecht improving its competitive edge", Tramways & Urban Transit, Feb. 1999 (61: 734), p.52-54.